When I gave one of my summer college application essay writing boot camps this last weekend in my hometown of Laguna Beach, I had 11 boys and one girl. I like to think of myself as someone who is gender neutral, and this comment caught me off guard. My first thought was: That’s hogwash. I’ve worked with hundreds of students on these dreaded college admissions essays for the last decade, and noticed little difference with the quality of writing between boys and girls. The variety in the overall writing ranged wildly from awful to brilliant, with most coming in somewhere in the middle. But that disparity had nothing to do with gender, as far as I could tell. In general, girls often had more confidence in their writing ability coming into the essay writing game than boys, but once most boys landed on a topic they liked and received a little guidance on how to execute their essays, they often aced them. I reflected for a moment on why my workshop attracted so many young men, and concluded that the problem was not boys and writing. The issue was well-meaning parents not believing their sons could write—and many have a tendency, as with all things college admissions, to panic and overreact. In fact, two of the boys were high school sophomores! In my opinion, that’s nearly two years too soon to start worrying about these essays. A couple were juniors, and I guess it didn’t hurt for them to start learning the college application essay writing drill. But I believe the seniors were on the mark, especially since they were the most focused and motivated. 3. Boys love action—and a good story (which go together)! I have found that once boys understand that the magic bullet of a great essay is an entertaining or interesting story from real-life—their life!—many of them have a change of attitude. If they can recall one they like, most boys are naturals at crafting them into mini-stories to use to power their essays. 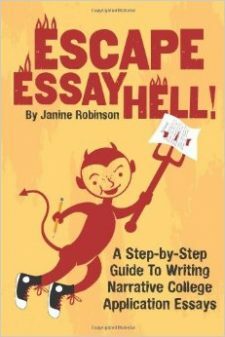 This can help you start: How to Write a College App Essay Even if You Think You Can’t Write. 4. Boys are more comfortable breaking the rules. Boys often end up writing the best essays because they have an easier time of letting go of all the English class writing rules, which often included using long words and a “voice” trying to sound smart. Once they learned that the goal was to “write more like they talk,” many boys are off and running with their essays. Learn how to Find Your Essay Voice. 5. Boys gravitate toward sports-related topics. Since many boys have been defined by their sports through playing them and fan culture, many first want to write their essays about sports. Often sports, especially sports injuries and victories, are red-flagged on the cliche list of college application essay topics, it’s worth trying to expand their thinking. Once boys are educated about the pitfalls of sports themes, however, they are typically game to explore other awesome topics. These can help: 5 Top Tips on Finding Topics. So there. Boys write just as well as girls. And many even better. Parents can stop worrying about them. It’s great to offer them resources to help them with their writing, but trust that once they know what they need to do—most knock it out of the park! What are YOUR thoughts on this? I would love to hear from students, parents, teachers, counselors, whoever has an opinion on boys and writing. Just leave them in the comments below. Thanks!